Very good quality. Colors are true to the picture and the cotton is so nice and soft. Provides a fresh, airy look for one of our spare rooms. I would recommend to others. 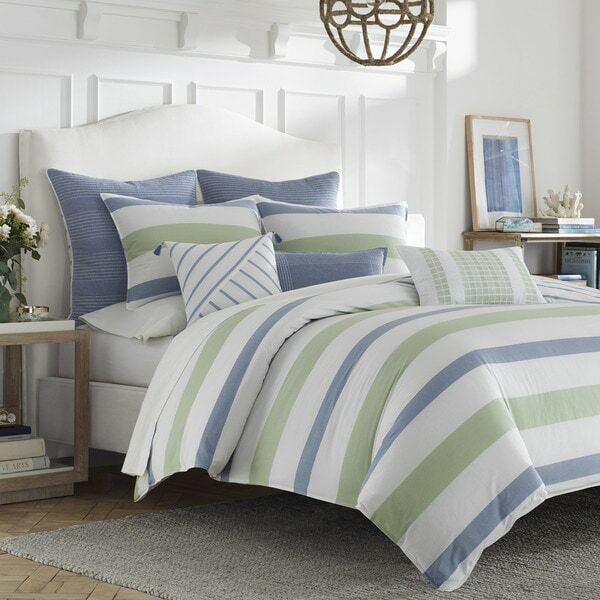 Create a laid-back vibe with this white, blue, and green striped comforter set from Nautica. Featuring a casual design that includes a comforter and matching shams, this bedding set captures the upscale class of a home in the Hamptons. Going for a nautical look but not too nautical. This comforter worked perfectly. Looks just like the picture! It is advertised as light weight but I would consider it a heavy weight comforter. Love this comforter set. It brightens the room and is super comfy! full of wrinkles. looks like something for a dorm. We purchased this set for our beach rental, and we could not have chosen a better set. The colors are beautiful in person, and the set perfectly emulates a coastal feeling. Looks as pictured (even better!) upon arrival. Got this for the guest room bed and it goes so nicely with the other decor. Very comfortable when it is chilly and need to act as a cover. Looks very nice on the other times when it is just decorating the bed. Love this comforter. It looks really nice in our new quest bedroom. Cute and good quality. Just wasn't as soft as I would've liked. I love it! It's just so beachy and very comfy. Like, don't wanna get out of bed comfy! Arrived with a stain. Was replaced for free. Great customer service and product. I like the nautical vibe, I just wish the colors were a little more vibrant. Love the colors. Pictures are pretty accurate. Lots of wrinkles which is expected with how they come packaged, but worth it. Definitely suggest purchasing. "Do you have matching throw pillows and the large 20 x 20 pillow covers"
"Do you have matching throw pillows and the large 20 x 20 pillow covers"
"Do you have matching throw pillows and 20 x 20â pillow covers for the Nautical Norwich set?"